The project to supply wastewater treatment to Gitmo included greater-than-usual logistical planning due to the remoteness of the location. 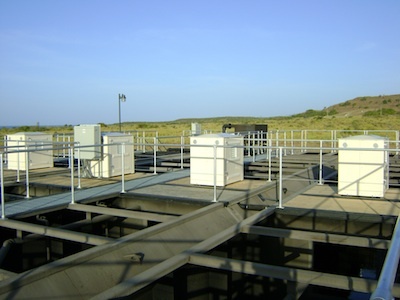 In 2001, with the growing population at Naval Station Guantanamo Bay, and expected future growth, a wastewater treatment system was needed to handle the increase in flows. Fluence worked directly with the United States Navy to design an advanced wastewater treatment plant to meet those needs. The intent was to supply four or five large packaged wastewater treatment systems at different locations around the base. Due to the inaccessibility of the area, a lot of planning was involved, from the start of the design process through the installation and startup of the system. The two key requirements for this installation were to treat domestic wastewater for discharge to a water body and to also ensure that a portion of the highly treated effluent could be reused as grey water. Transportation logistics also proved to be challenging: the installing contractor had to use a dedicated barge to transport the system from the United States mainland. A 300,000 GPD advanced extended aeration packaged wastewater treatment system was designed to treat the domestic waste. This system was sized to meet the effluent requirements of 20 BOD5 and 20 TSS to allow discharge into the ocean. The influent wastewater characteristics were typical for domestic wastewater; 250 mg/l for both BOD5 and TSS. An additional requirement was that 35,000 GPD of effluent had to be treated to standards for reuse as grey water. To meet this requirement, a rapid sand, dual-cell tertiary filter system was supplied; the system has been shown to provide up to 35,000 GPD of effluent at 10 BOD5 and 10 mg/l TSS for reuse. All of the pre-fabricated wastewater plant equipment, including 12 prefabricated carbon steel tanks, were shipped on a single barge. Fluence was also responsible for the startup of the wastewater treatment system and for training the base personnel to properly operate and maintain the plant.